Ever notice something weird about how Netflix imagines its customers? 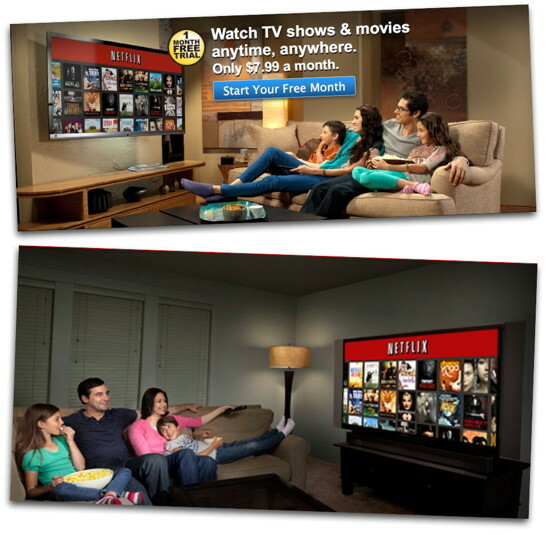 If you dream of being a Netflix family, photographed on Netflix's home page, and you don't mind stiff necks from watching TV with your head turned at an extreme angle, just follow these simple steps today! Turn every possible light on in the room so it is brilliantly lit (if you have some Klieg lights, turn them on as well). Arrange the sofa so it is at least at a 45 degree angle (though 90 degrees is preferable) relative to the television screen. Tell Sis go cook up and eat a huge bowl of popcorn (she's very hungry). Make sure Mom gets the remote control: she's in charge. Ask Dad to put his arms around everyone. Enjoy browsing the Netflix movie menus. You don't need to actually watch a movie; just browsing Netflix's offerings is where the real fun is!